I am sure that it is no large stretch for me to say that this episode of The Mindy Project was a backslide in more ways than just the return of former Pastor Casey. I'm not even speaking about the quality of the episode either; this episode was thematically reminiscent of season two. Outside of one small mention, Leo was not prevalent whatsoever, and Mindy's misadventures — whether with Casey or with any "wacky schlub" that has passed through Mindy's life before or since — emphasize the same sort of things that have always been emphasized: Mindy's an unlucky-in-love, confident woman who keeps running into the same kinds of people and keeps bantering with them until they fall in like, or love, with her. It's a backslide in that nothing feels especially, crazily new, from the workplace will-they-won't-they to the wacky Internet misunderstanding (do you guys still remember "Danny and Mindy"?). I don't know if this is a bad thing. As someone who began writing about this show in a very serious and almost academic way, it's definitely not interesting. So Mindy says that she is done messing with guys who are immature, but is still, through the show's design, romantically linked to Jody and Danny, two outdated, emotionally stunted men? How is this promise — one that we're led to believe comes from motherhood, or from a severely broken heart — meant to stick any more than that time she dated perfectly reasonable Cliff, or the first time she broke up with Casey for surprisingly mature reasons? It's the lack of continuity that this show has (ironically) continuously dished out that makes it hard to imagine that this episode has staying power outside of the Jody and Mindy story. We know that Ne-Yo isn't the newest member of the ever-revolving cast of men, although with his charisma and maturity, wouldn't it be cool if he was? So we have to know that this story won't stick around, and based on this show's track record, I imagine it will end in a way that sacrifices what is known to be true about Marcus so far — you know, in pursuit of a joke. To an extent, that's what happened with Casey (remember his DJ'ing 180?) and Cliff (though to be fair, no one should ever have to outlive a grandparent!) and Danny (remember his, uh, total 180?). I'm not saying that this episode was bad. I mean, I did just write three paragraphs about it that weren't really "positive." I actually enjoyed this episode a fair bit. Written by Chris Schleicher, a personal favorite of mine, this episode was hilarious, edgy, and well-paced. I did love Ne-Yo as Marcus; I did love the return of the five-point plan; and yes, I love Anders Holm, who is game to do whatever the show asks him to do. 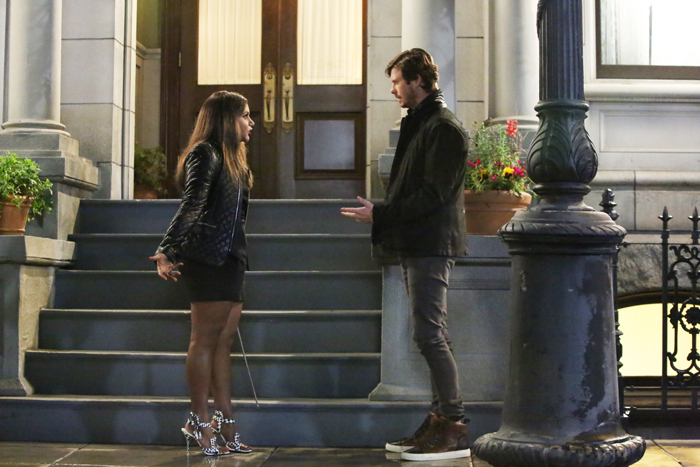 He and Mindy Kaling have an easy, low-stakes chemistry that is compelling to watch. I remember reading somewhere once that Mindy and Casey were the equivalent of a college relationship: immature, passionate, cute, but not permanent. I think that having that expectation for it means that every time it is revisited, I am always pleasantly surprised by what I am seeing. I also really liked the utilization of the other characters. Tamra continues to low-key kill it, and I would argue that for every time the show tries to convince me Morgan is the break-out character, Tamra finds five ways to support her own case ("What about the weird stuff going on in our lives? I keep seeing the number 16!"). Jeremy had a believable and funny role as a "Buchanan" groupie, and I still believe that the show needs to find ways for Ed Weeks to flex his acting muscles, because he's certainly capable. Even Jody was great. As an episode of TV, it was a really fun watch. I'm so happy the show is going back to the lightheartedness that it used to have, simply because there was so little joy in Mindy and Danny's seasons-spanning conflict. I truly feel that this second part of the season is the most confident the show has ever been in what it wants to say, how it wants to be, and who it wants Mindy Lahiri to be. But as always, I feel that something is missing. Maybe it will be found when the Mindy-Jody conflict comes to a head, however that may be — I personally believe that Jody and Mindy will not end up together, and if that's the case, I am excited to see the character development that comes from that. I also would like to see the remnants of Mindy and Danny resolve themselves in some way that suits the characters rather than the jokes-per-minute quota, even if this means that Chris Messina is gone for good. If the other characters could create and sustain a long-term story, I would love that. So at the end of the day, this show's funny and cute. Mindy and company are remarkably talented. But it's a Minion in a Shrek costume: it's pretending to have heart on the outside, but there's something not quite right, something unsettling and weird. Hopefully this feeling will not be as permanent as a back tattoo. Also, MINDY DID GIVE THE RING BACK TO CASEY. This is a huge irritance, especially as someone who adored that episode and break-up scene. ALSO, "GOOD FRIEND" MARCUS SHOULD NOT DATE MINDY, OBVIOUSLY! With that said, I really did like this episode. It was so well-structured, and I know that sounds weird, but it's nice to see this show being this confident. I like Jody and the actor who plays him an awful lot, though no matter how much skill he has with acting, he cannot generate positive chemistry with Mindy Kaling. I buy that he has an awkward crush, though. And with that said, I will miss Ashley! I wish this show would let some people stick around and breathe a little with some of its guest cast. One genuine nitpick I have outside of "lack of convincing character development" is that I am tired of no one calling Mindy out on anything or finding her less than charming. I think for how often she puts herself out there, and how often she's putting herself out there doing less-than-attractive things (eating entire swords of meat, for example) you would think at least one person would not be buying what she's selling. Ne-Yo did do an awesome job, though. I hope he sings.